This is what I had to look at this morning. 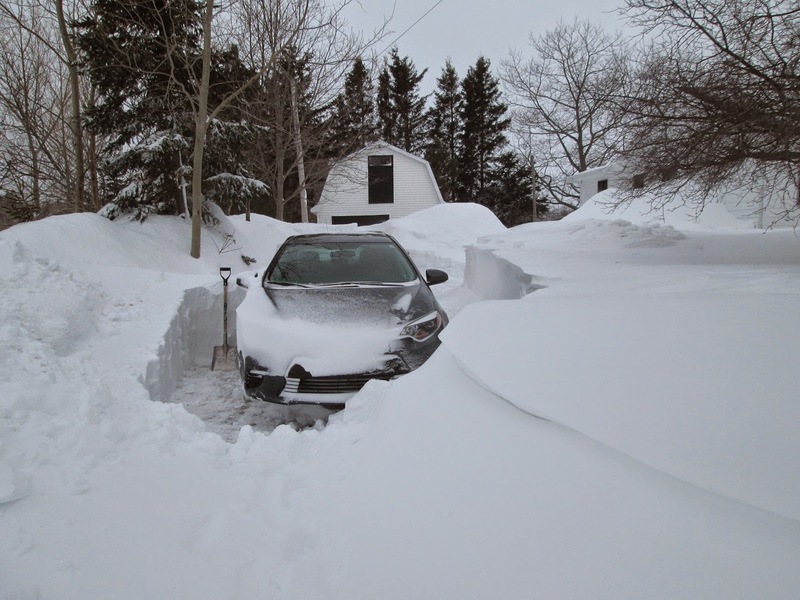 Forecast was for 5 cm but I would say at least 10-12 cm of wet snow. 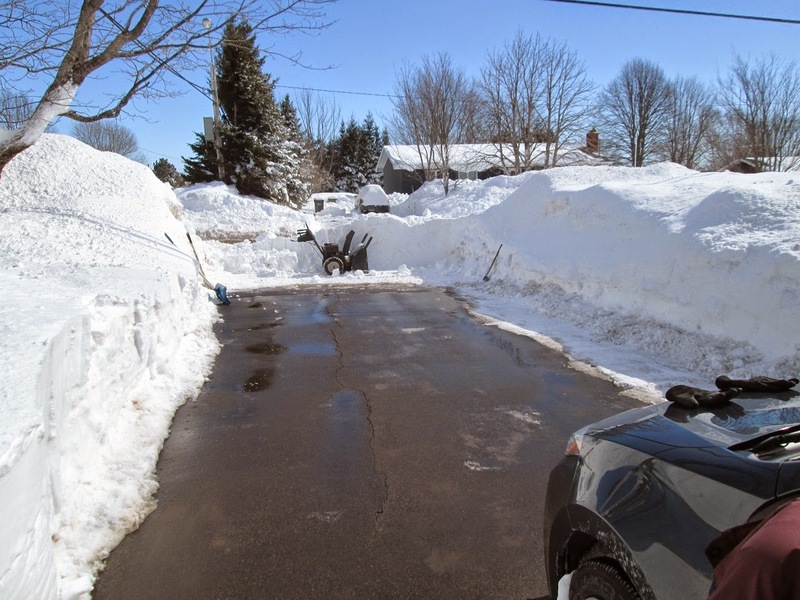 I just used the blue plastic pusher seen on the right to clear the drive. It was the prefect snow if you wanted to build a snowman. Late in the day the sun came out and the temperature got up to 5. No cycling today but did watch some curling in the afternoon. I cycled to New Haven and back again today. The only section of the highway where the shoulders are dry enough to cycle on. 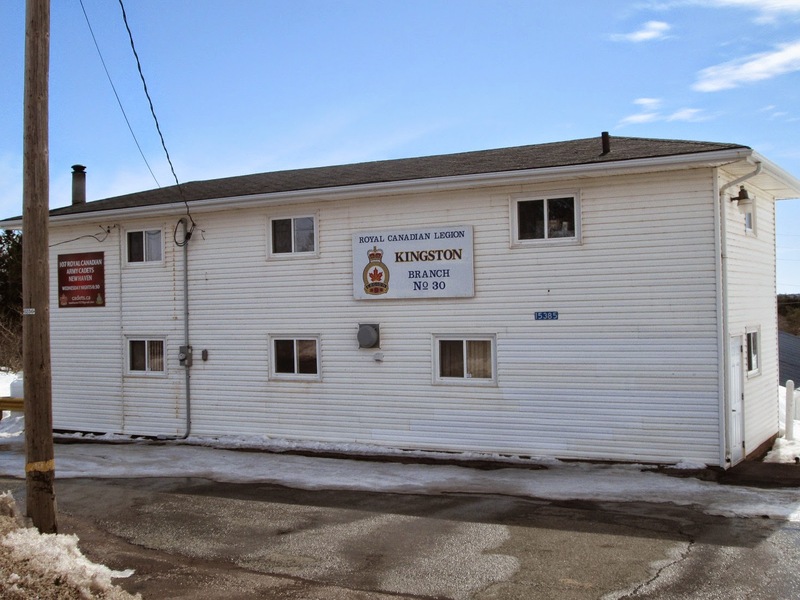 Although Kingston is several km away, they have their Legion hall located in New Haven. A sunny day at +2 but a south west wind at 30-35 km/h. After lunch I was out cycling, I cycled the highway to New Haven, about 11 km one way. It was sunny at +1 with a light west breeze. 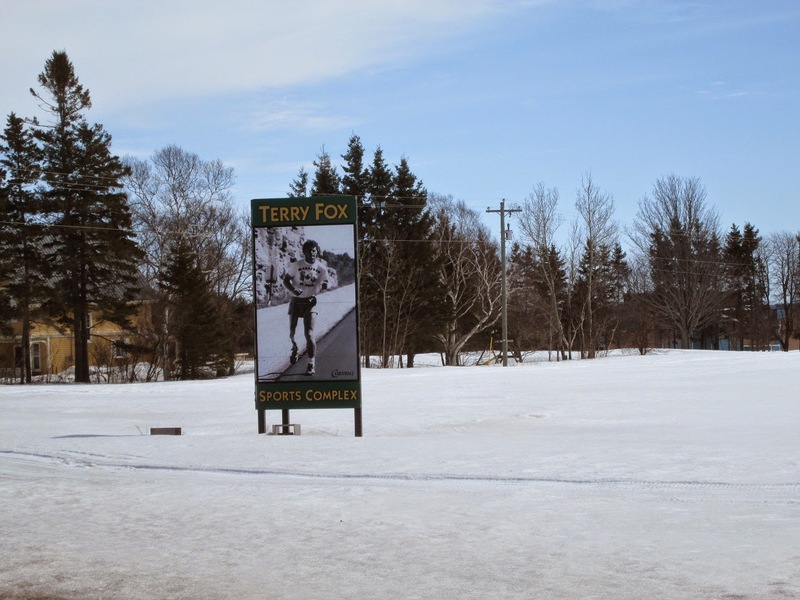 The Terry Fox Sport field is in Cornwall. 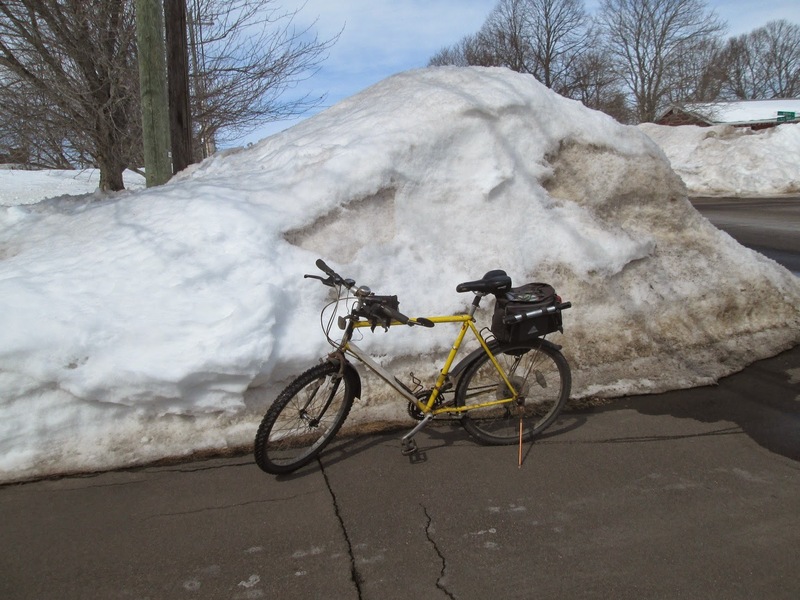 I was using my old bike, purchased it in 1993, I have added the fenders for the winter riding. There was a few wet spots on the shoulders today but not too bad. 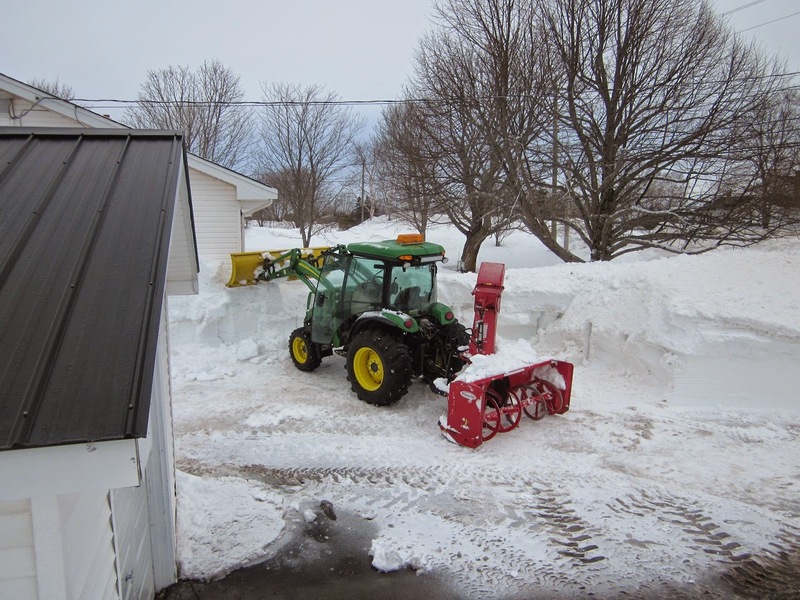 My neighbor brought in the heavy equipment to move some of the snow from around his house. 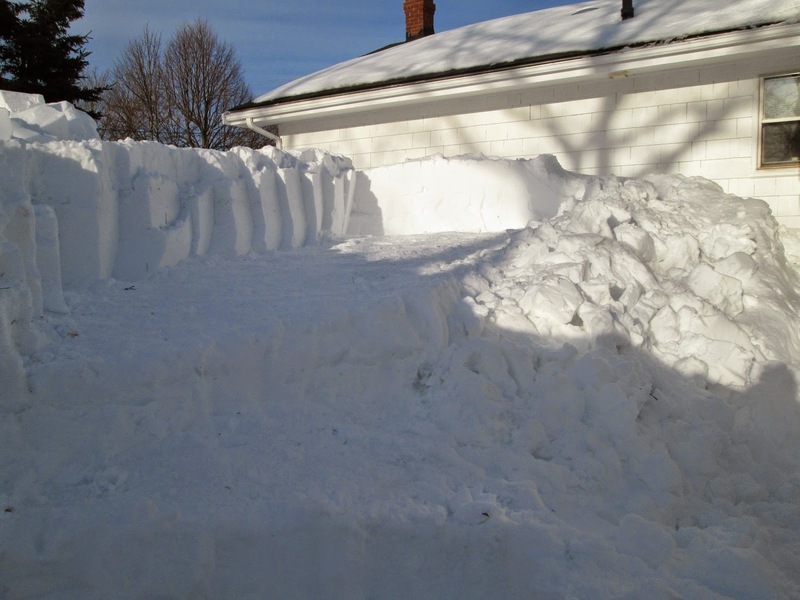 I did it the old fashion way by shoveling, I did the north end and the east side. 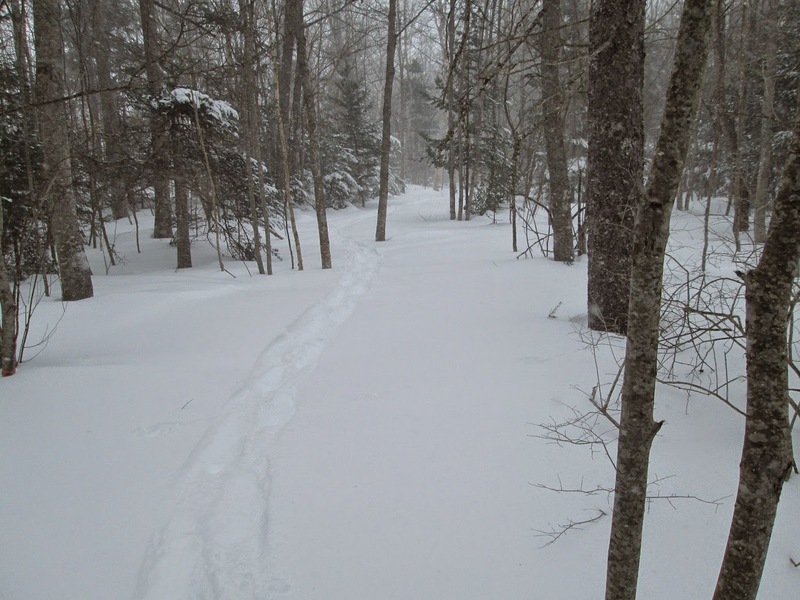 I then went out on the snowshoes for 72 minutes. I went as far as the business park. 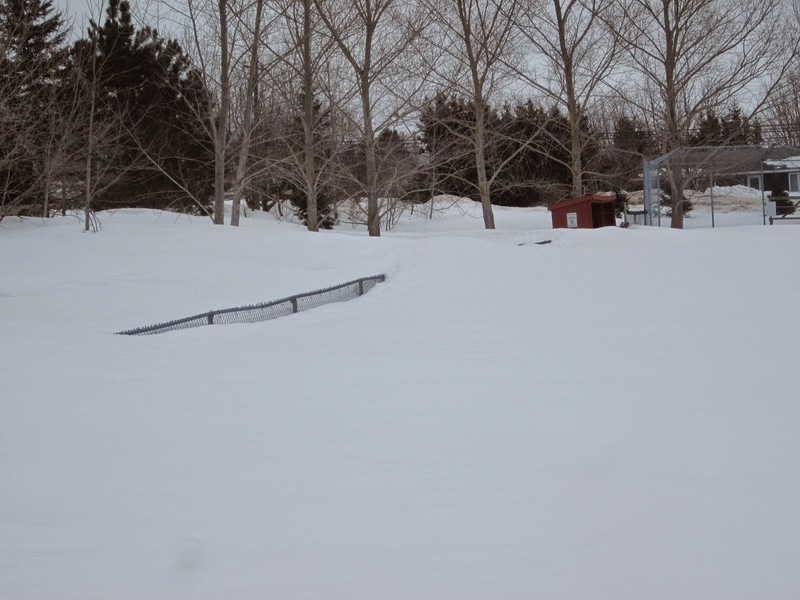 There is a little of the ball field fence starting to show up but lots of snow to melt yet. Overcast at -2 with a NW wind 35 gusting to 45 km/h. 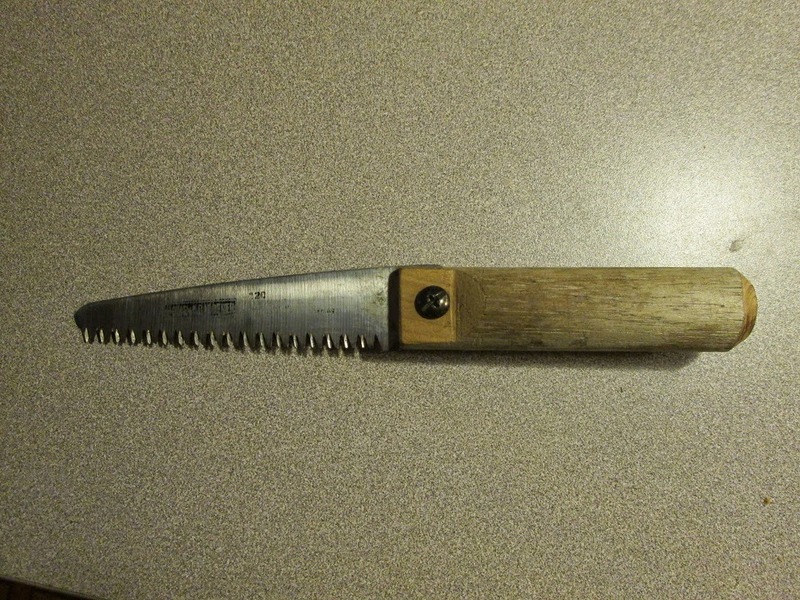 My folding campsaw that the handle broke now has a handle but it doesn't fold. 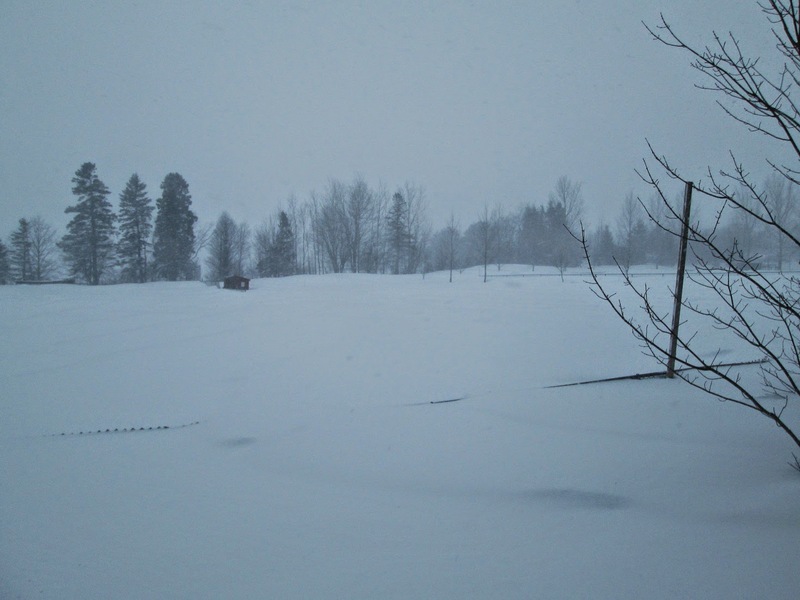 Mostly overcast with a high of 5, with the help of some rain last night the snow is starting to settle. 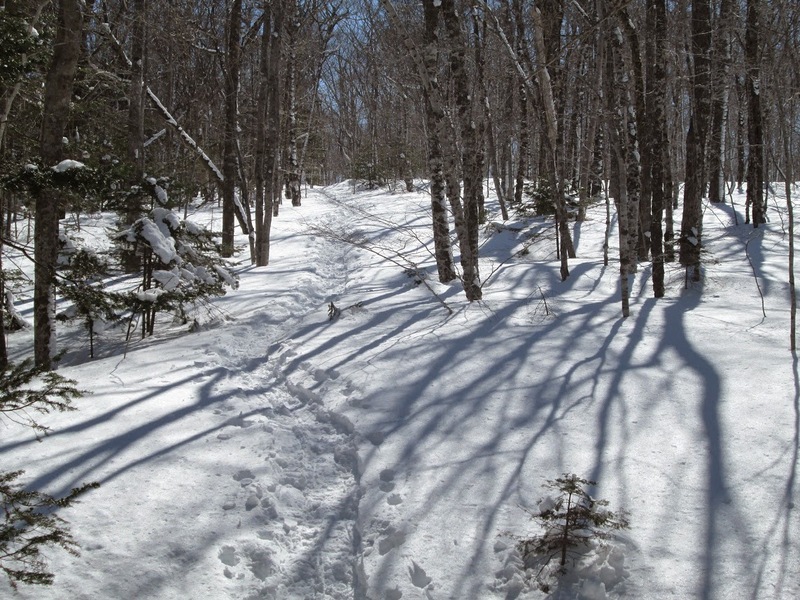 After lunch I donated plasma, then about 4:00 I went out on the snowshoes for 40 minutes. I was as far as the edge of the business park. 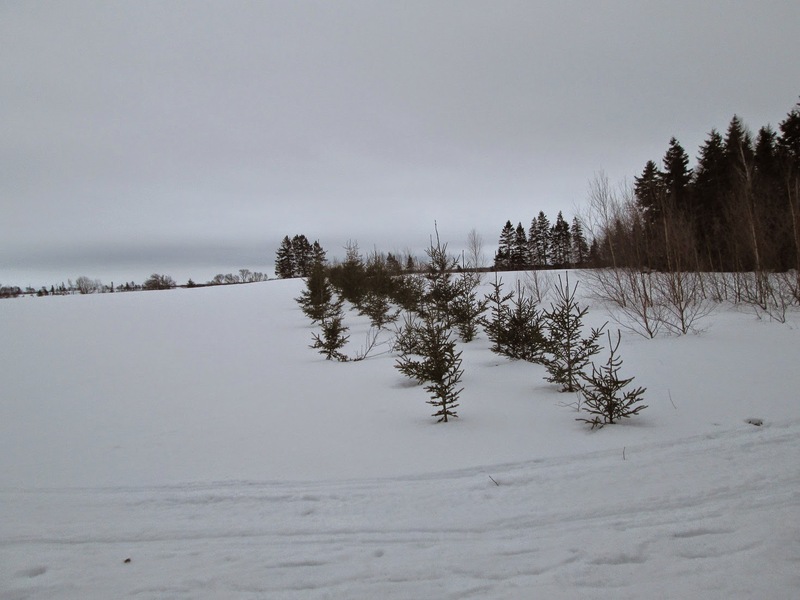 The three rows of spruce trees is the property line. Overcast day with a high of 4 and rain in the forecast for tonight. 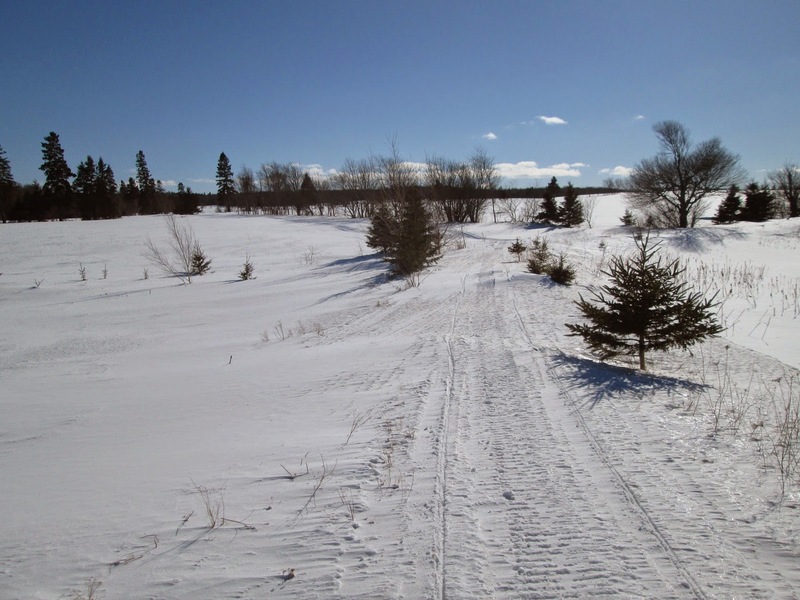 The trail is well used by the look of the number of tracks. Looks like a large group was out on the river ice. A nice day, sunny around the zero mark. 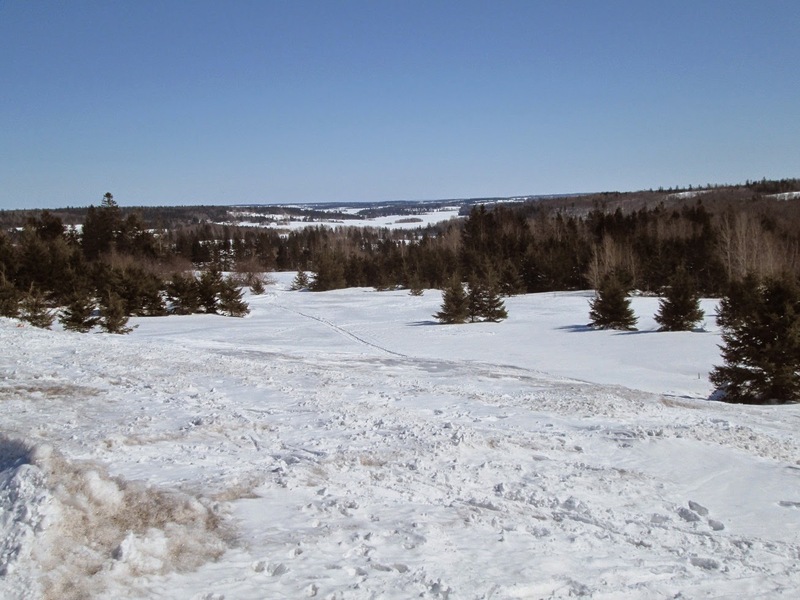 This is the view from the parking lot, looking southeast towards the Bonshaw river. 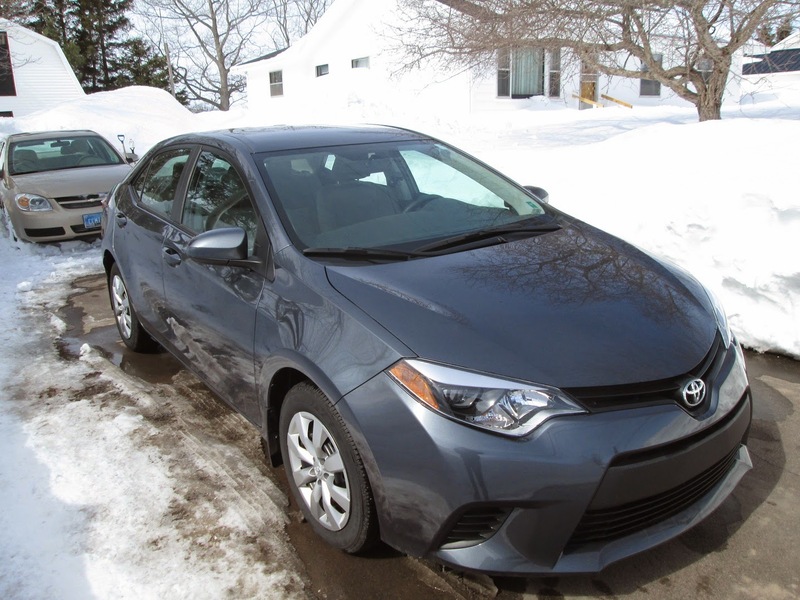 It was sunny at -1 with a light breeze, so I dug out the second car. 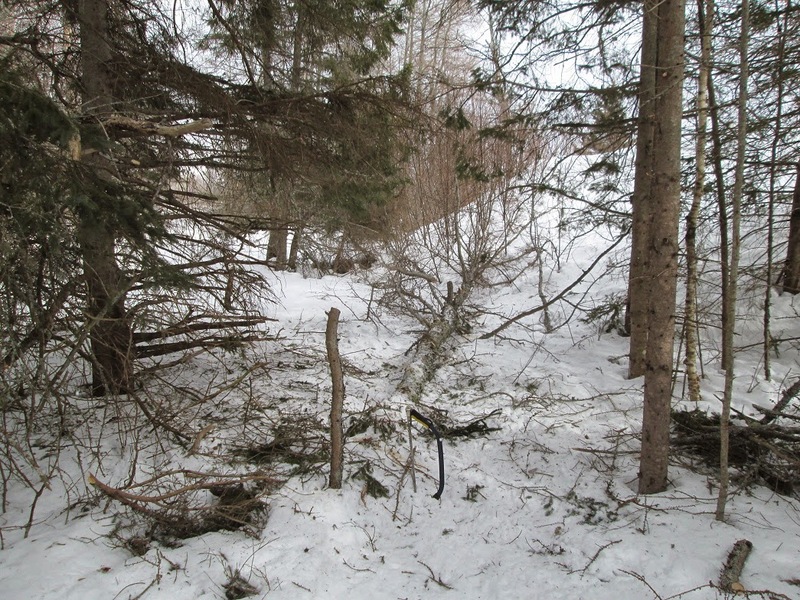 Also removed some snow near the house for water control. Forecast is for +6 on Thursday with some rain. 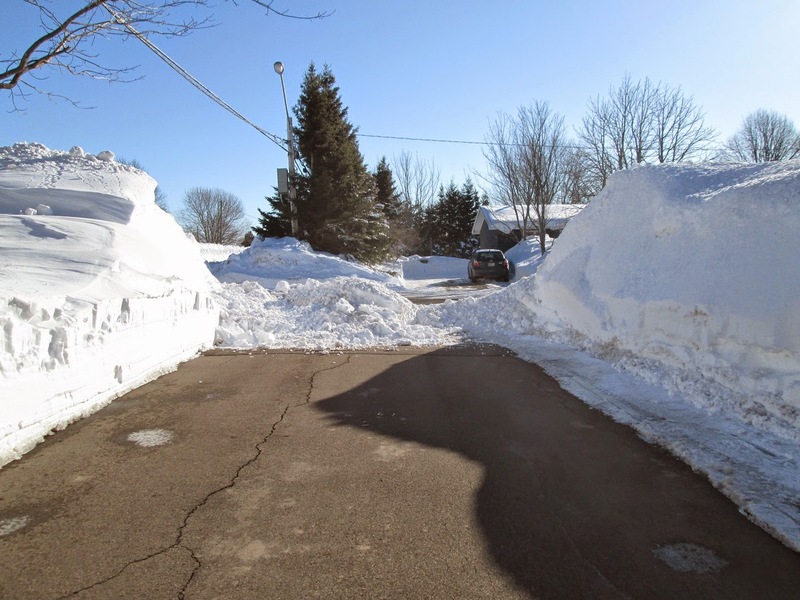 The town snowblower was clearing the side walk. This tree that was blown down last November now is out of sight. 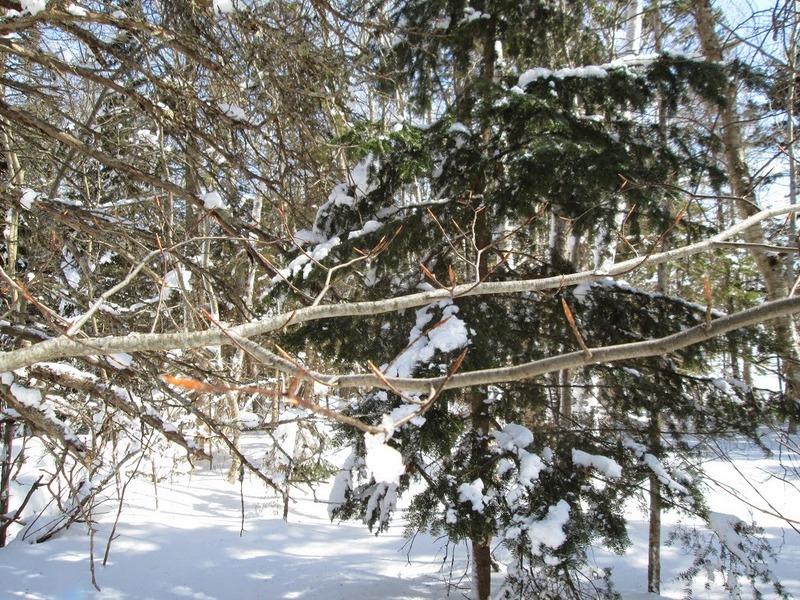 I was out on the snowshoes for 90 minutes today, This maple tree has buds coming out on it so spring must be coming. 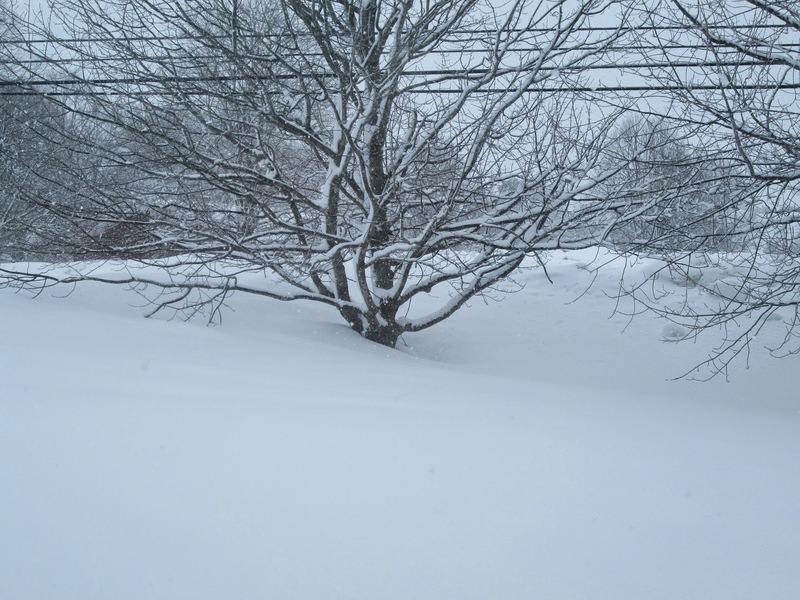 The tree in the first photo is under this snow drift. Very windy in the morning at -14 but by late afternoon the wind died down and the temperature was up to -5. Today's snow was wet and sticking to the trees and wires. But then the temperature dropped and the wind picked up to 60-70 km/h. 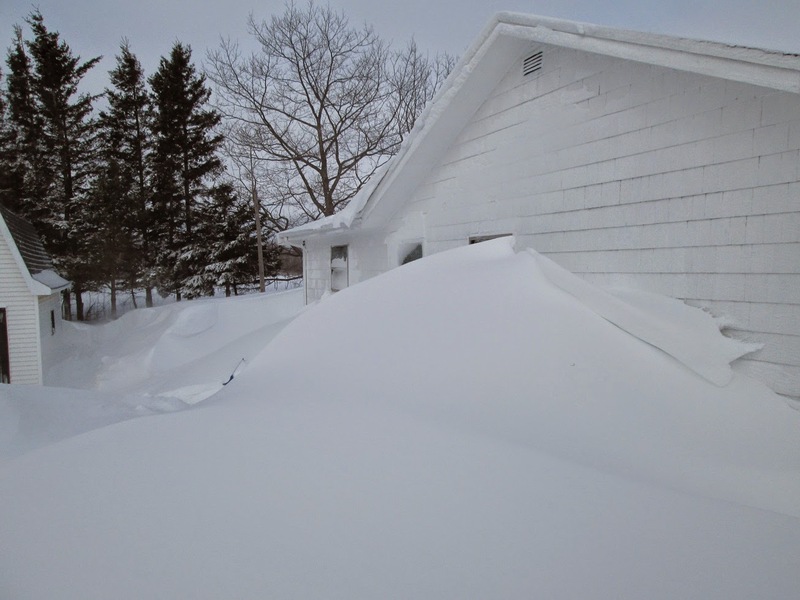 So we had drifting snow all afternoon, the wind is still gusting 55 km/h so there would still be some drifting snow. 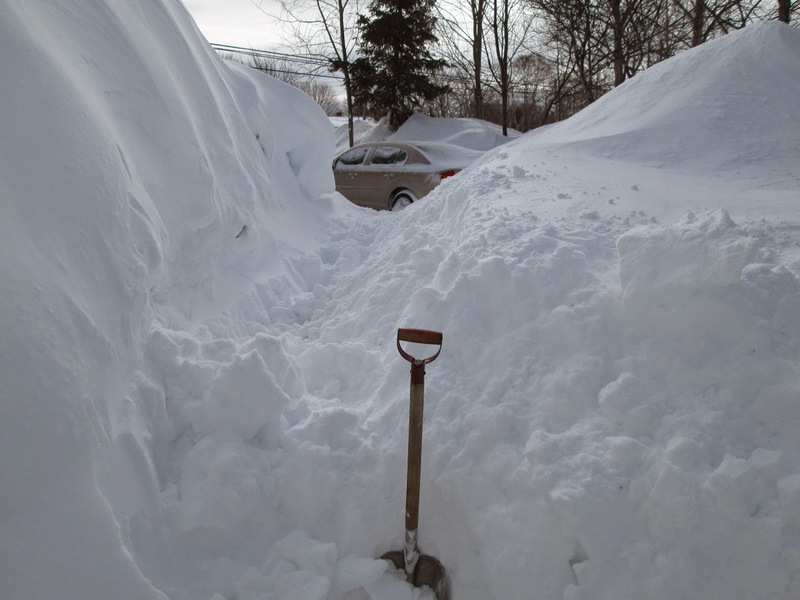 I expect it will be another digging out in the morning. 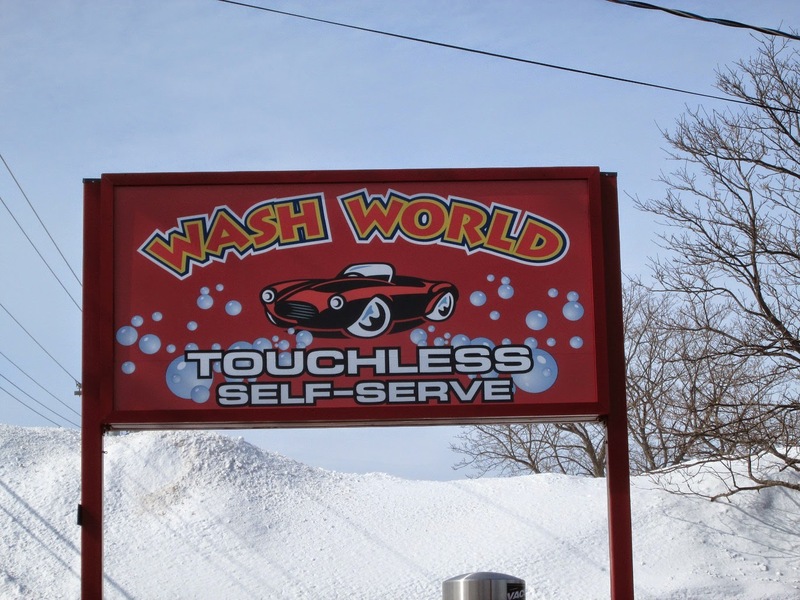 The temperature was up to 3 with a light south wind, the car was dirty, so of to Wash World. Three dollars and four minutes later, a clean car. Unfortunately it will only stay clean til the next trip. 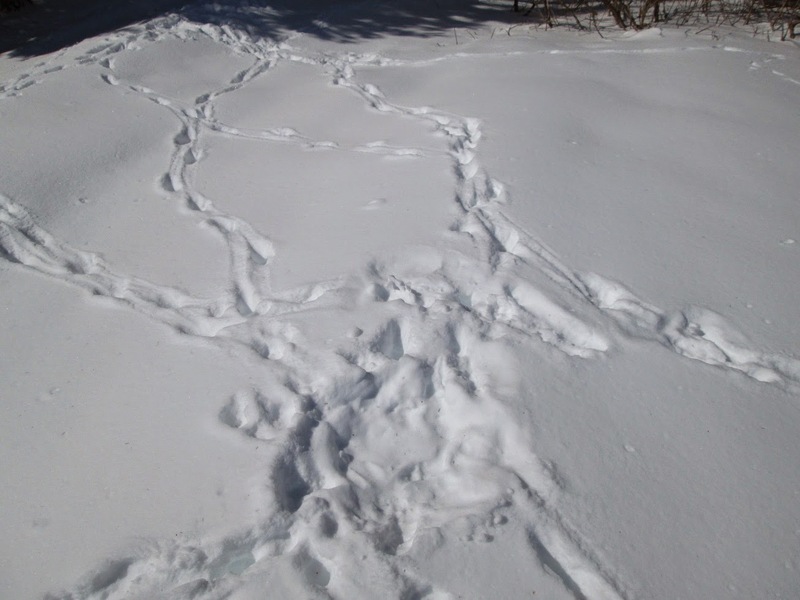 Around 4:00 I went out on the snowshoes for a hour. I went as far as the business park. 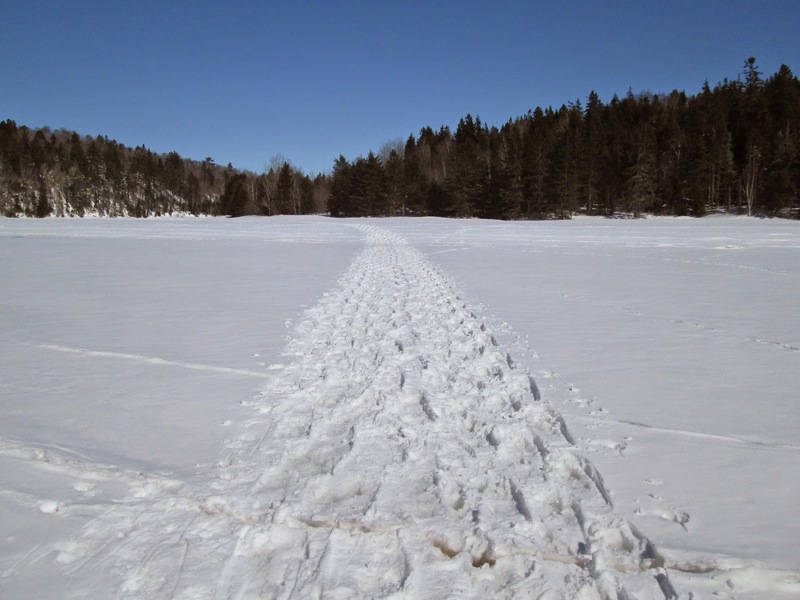 Not good going, snow was a little soft and was sticking to the snowshoes. 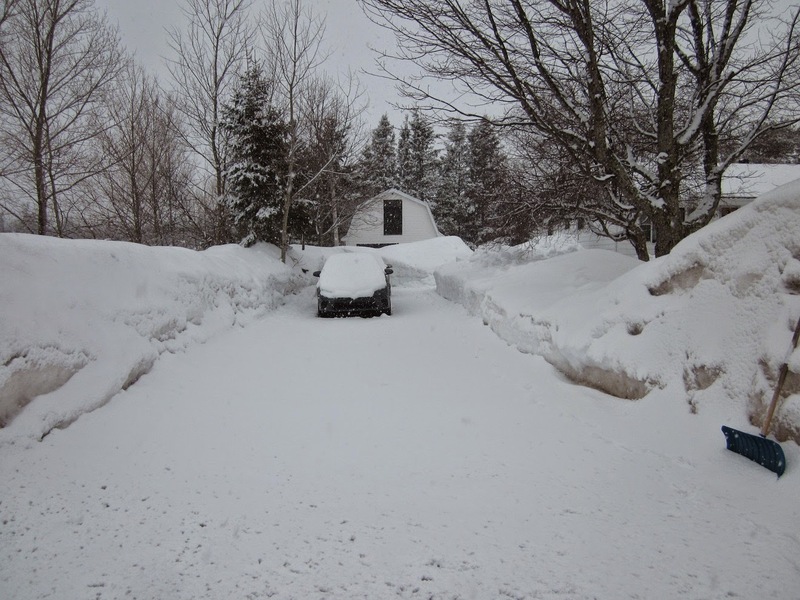 This is what greeted me this morning, Highway plow had gone by widening the road. 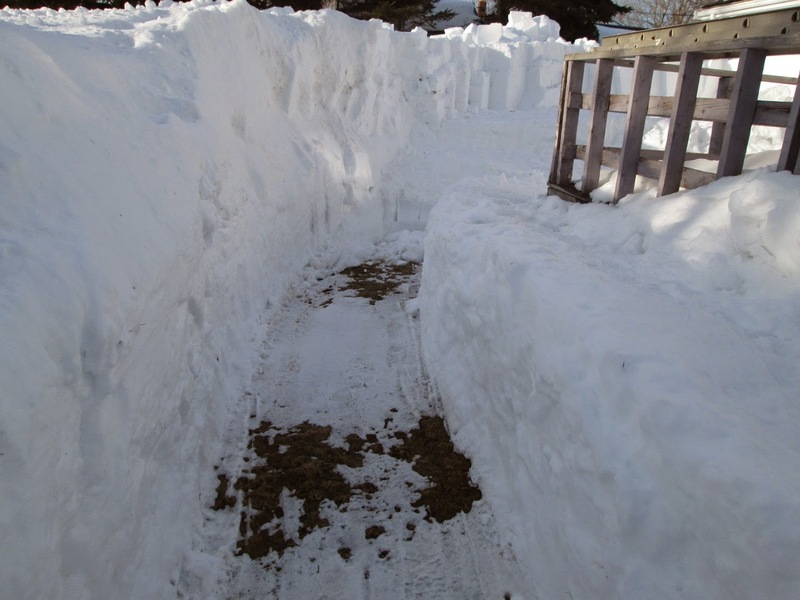 Because it was hard packed snow it took a couple of hours to clear it. 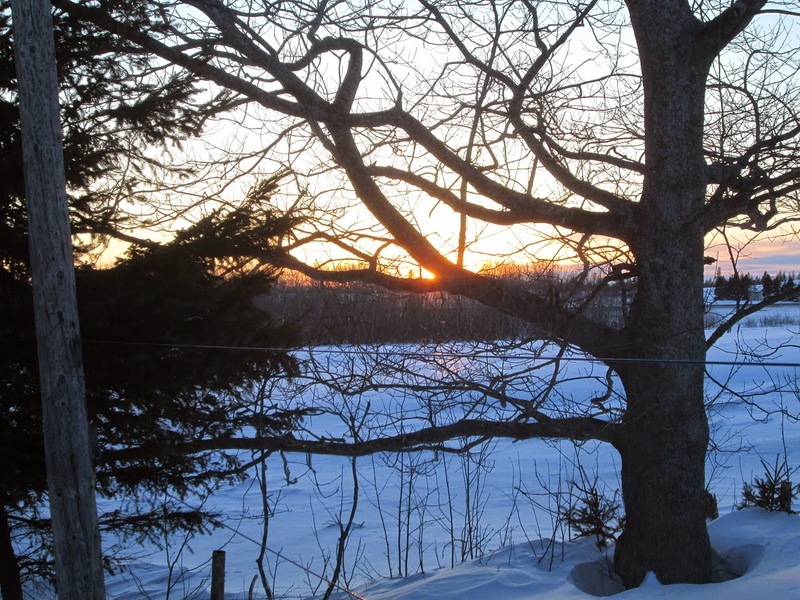 After supper I went out on the snowshoes for a hour, sunset photo taken as I got home at 7:15. 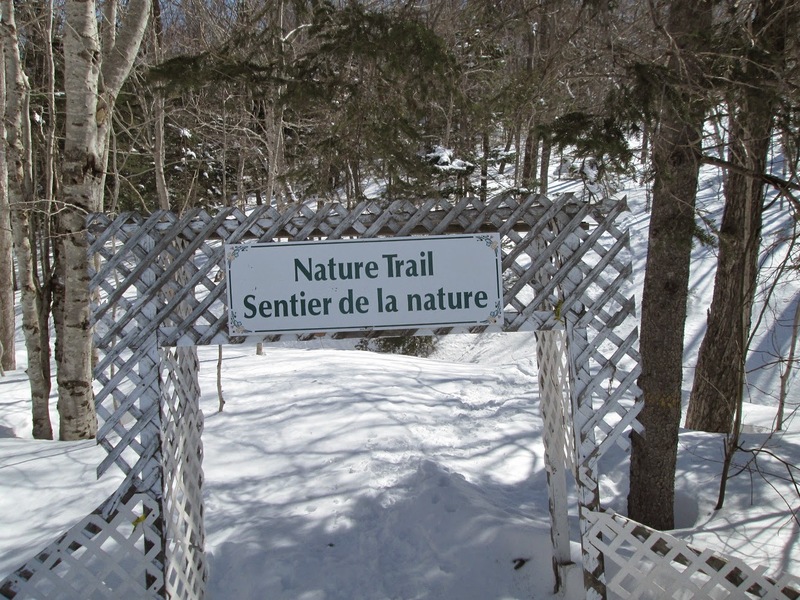 Mostly sunny with a high temp of -4 and light winds. 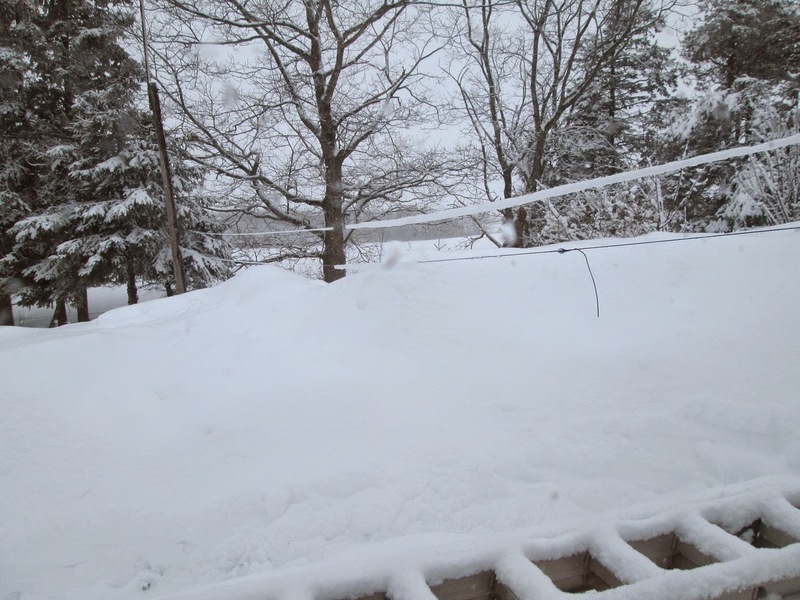 We had another 20 cm of snow yesterday with high winds. 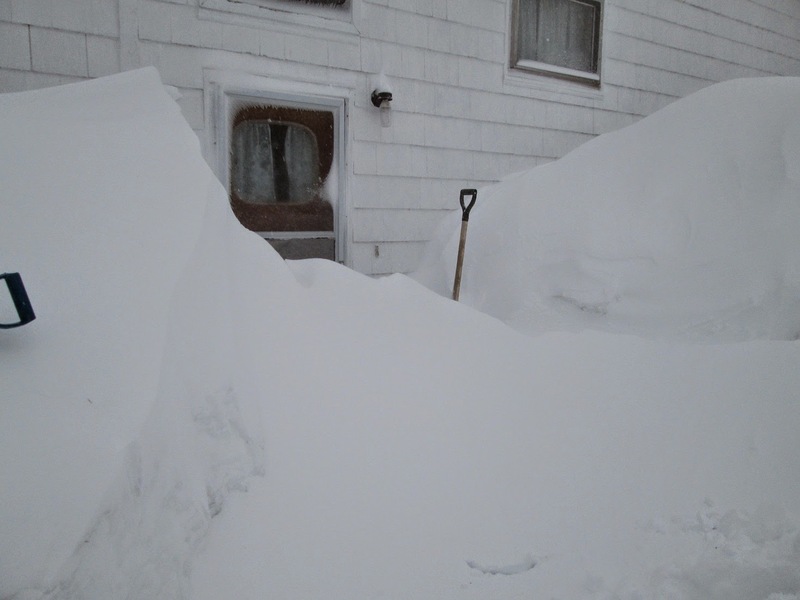 The drifts just keep getting higher. 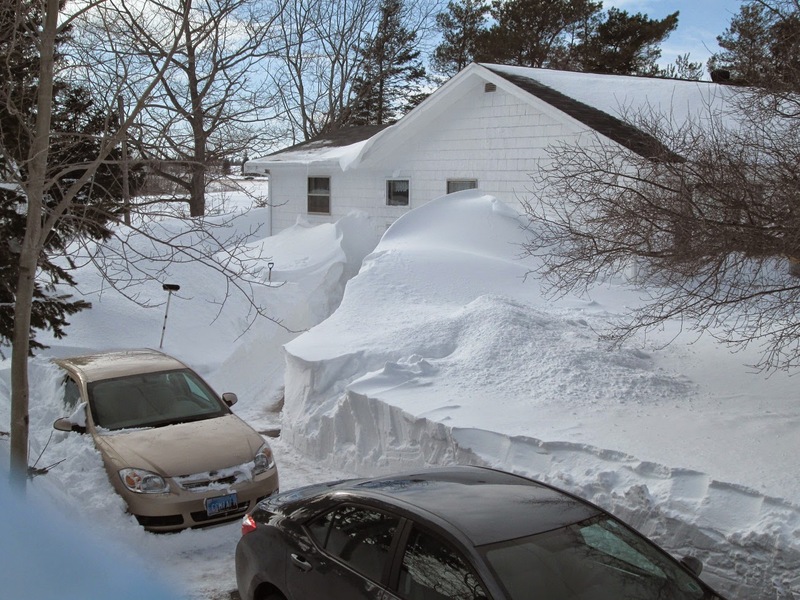 This was taken from the top of the drift at the end of my driveway. 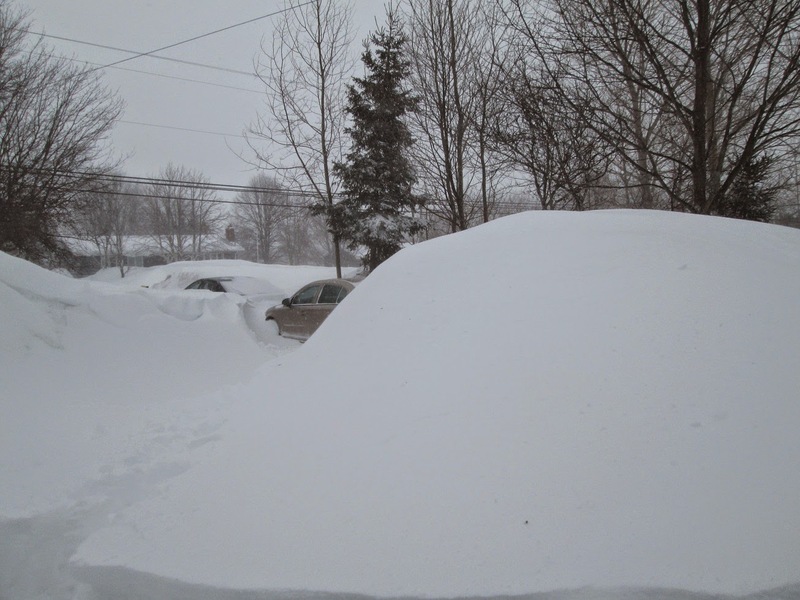 It looked like this as I started around 10:00, I had shoveled around the car yesterday. It was after 10:00 PM last night when the first highway plow came though. 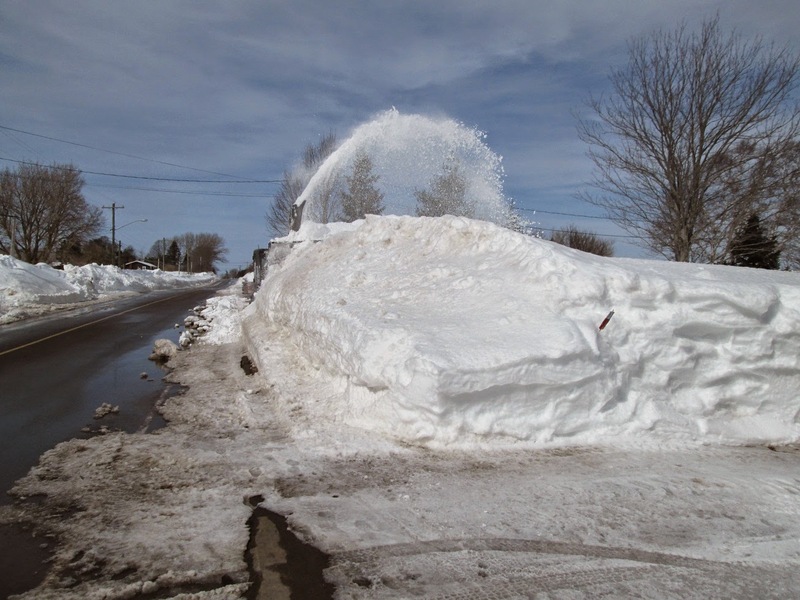 Other then the snow that the highway plow rolled in the snow was good for blowing. I took a break for lunch at this point. 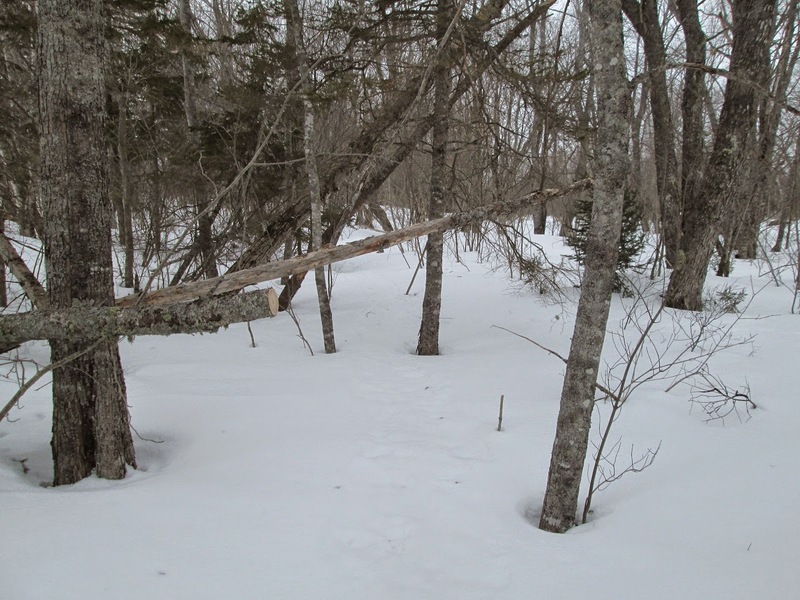 Mid afternoon and the job is finished, I then went out the snowshoes for 30 minutes, I travel the same trail as yesterday that took 45 minutes because I was breaking trail. Temperature got to -1 with a very light wind. 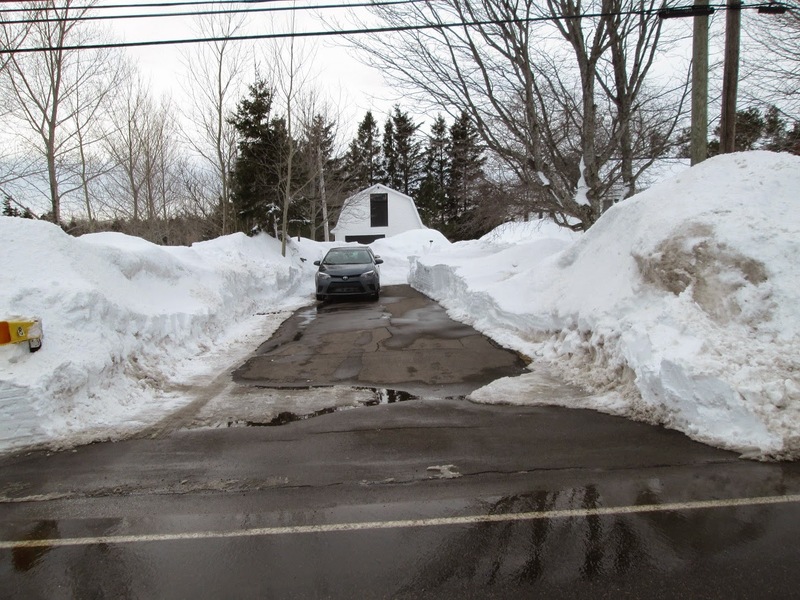 Not quite as much snow as the one three weeks ago but the drifts higher as we still have the previous snow. 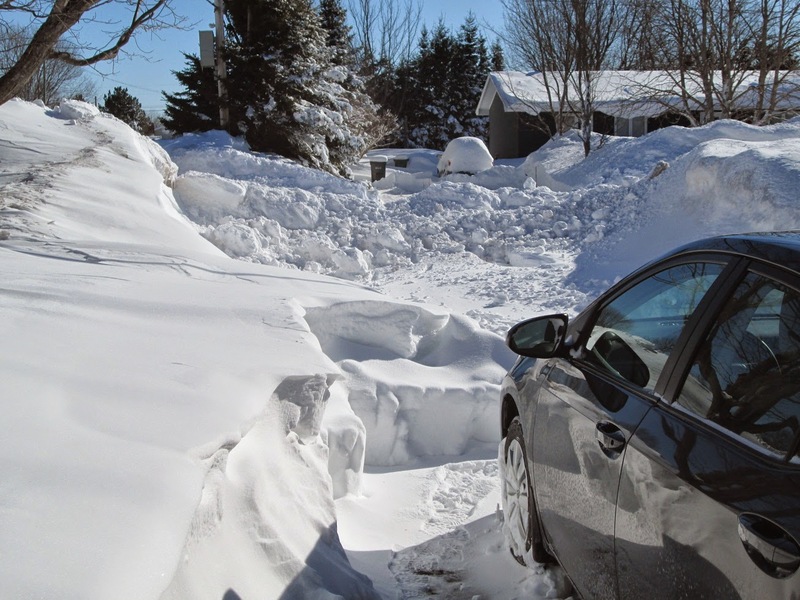 The drift behind the vehicles is at least a meter higher. 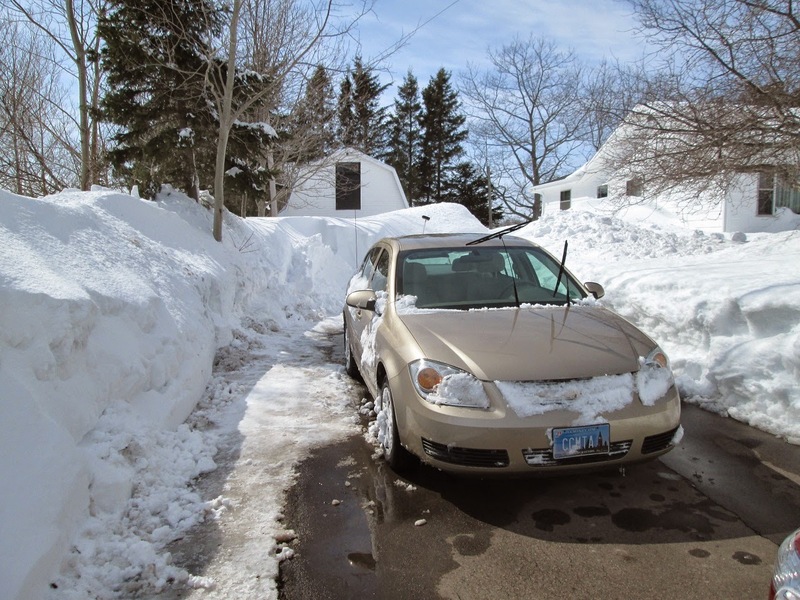 I shoveled around my car, I don't like going to close with the blower.I didn't clear the driveway, waiting for the road snowplow to go by. As I post this 7:00 PM the plow as not been on the road yet today. 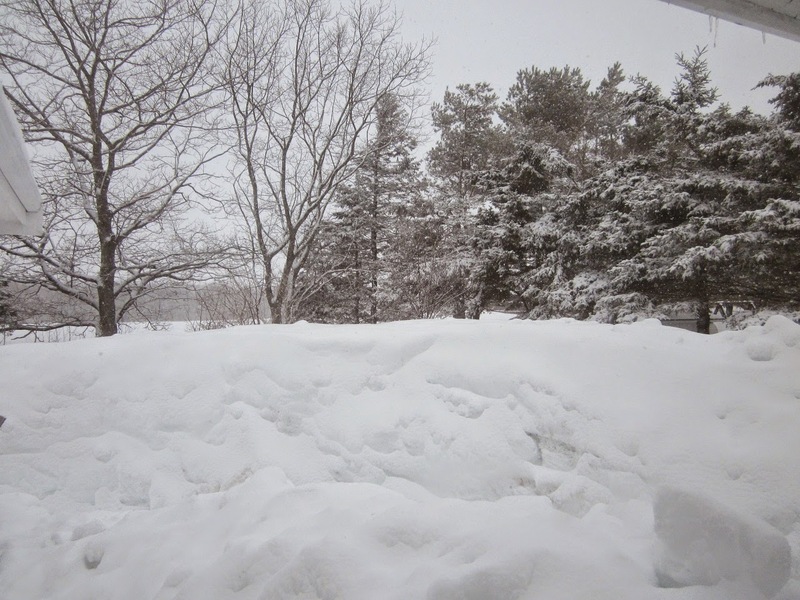 Another major storm today, was out for 30 minutes around 1:00, snow and blowing snow. 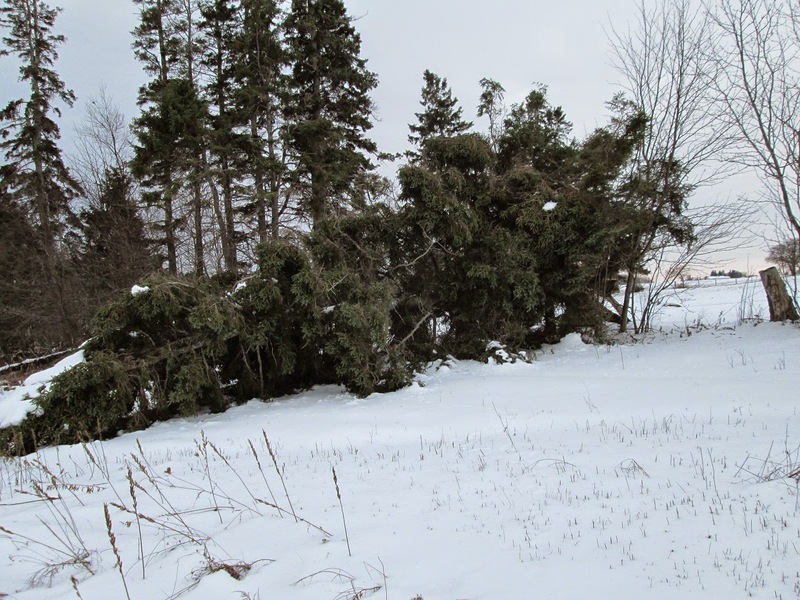 At the time wind was 40 gusting to 55 km/h. Later in the day and still is 55 gusting to 75 km/h. Temperature not too bad, around -5. 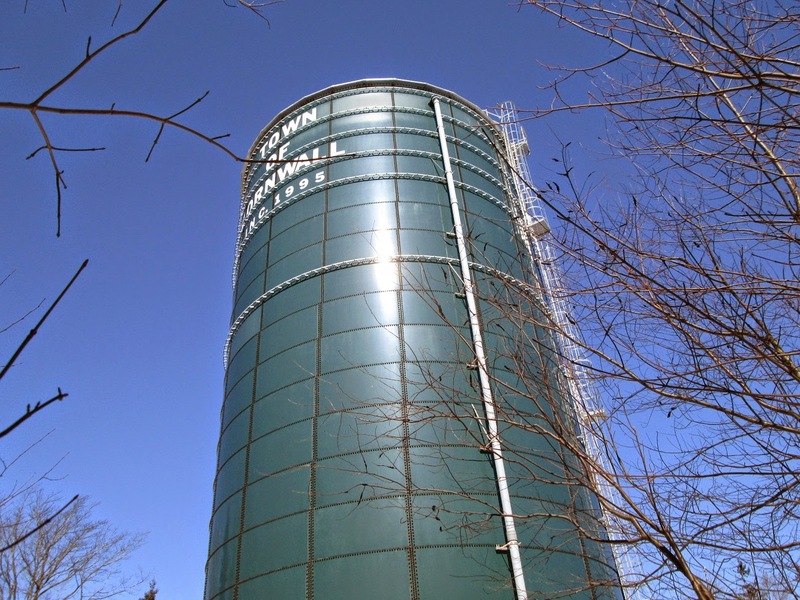 I was out on the snowshoes for 75 minutes, I was to the business park and went around the water tower. 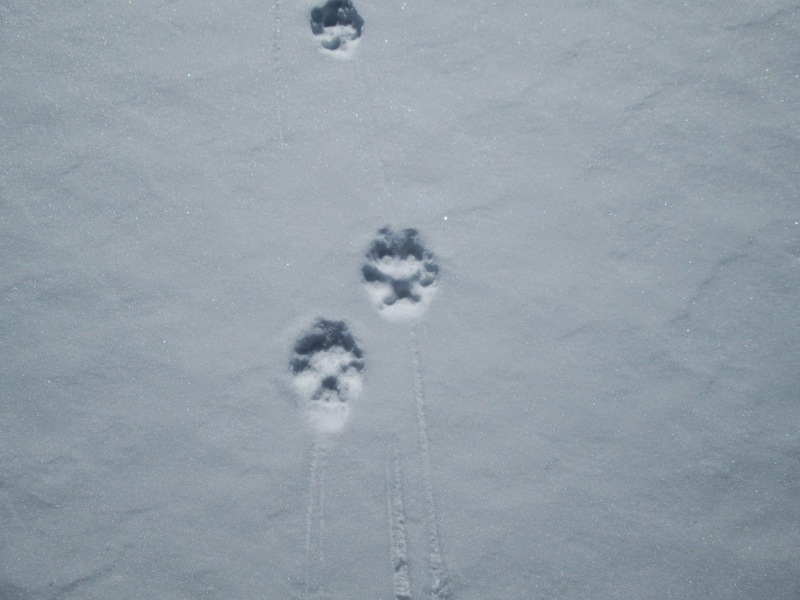 I am guessing these are coyote tracks. 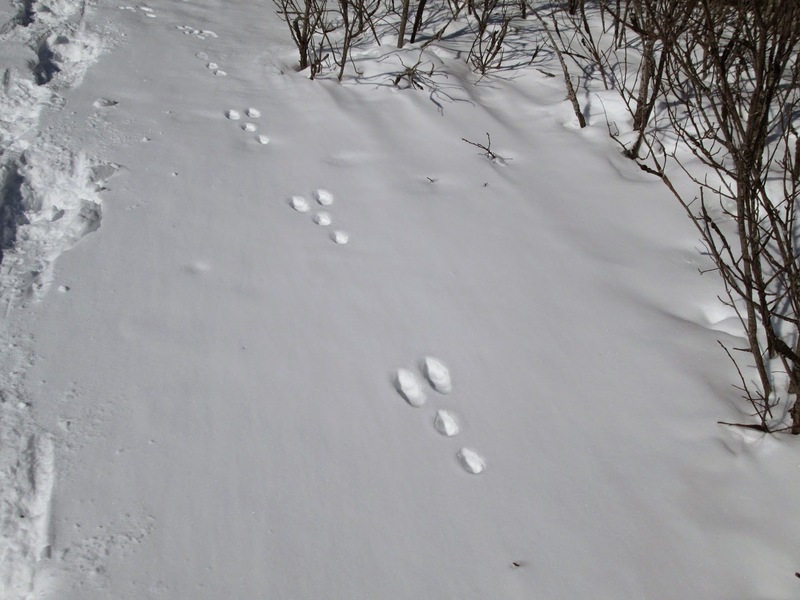 A rabbit passed by here. Sunny at -4 with very light wind. 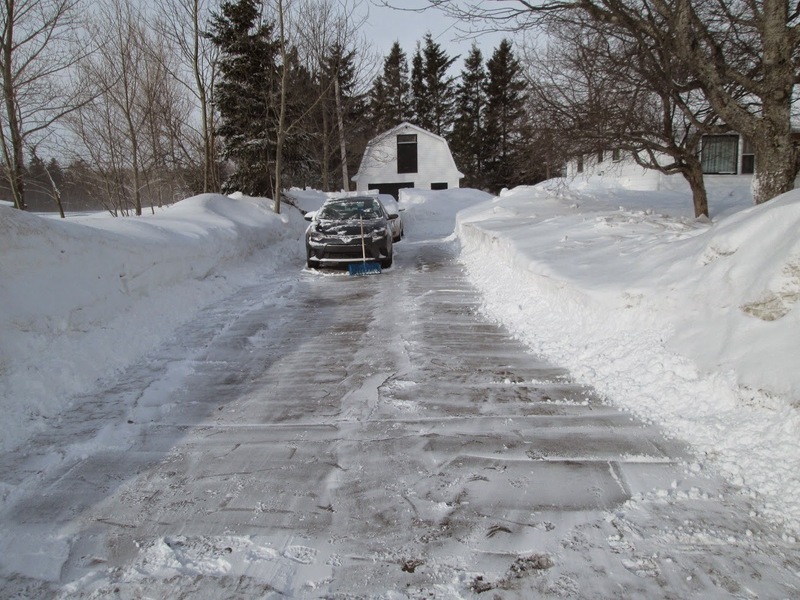 About 5 cm of snow last night, a light snow so I just used the pusher to clear the driveway. 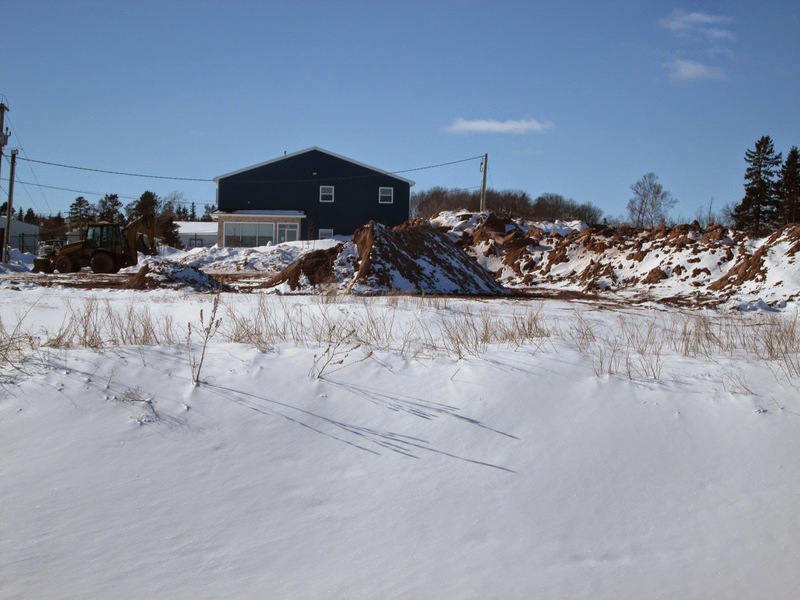 I was out on the snowshoes for a hour, I went by the Government sand pile for the roads. It will soon need to be resupplied. Lots of snowmobile traffic in the same area by the looks of the tracks. 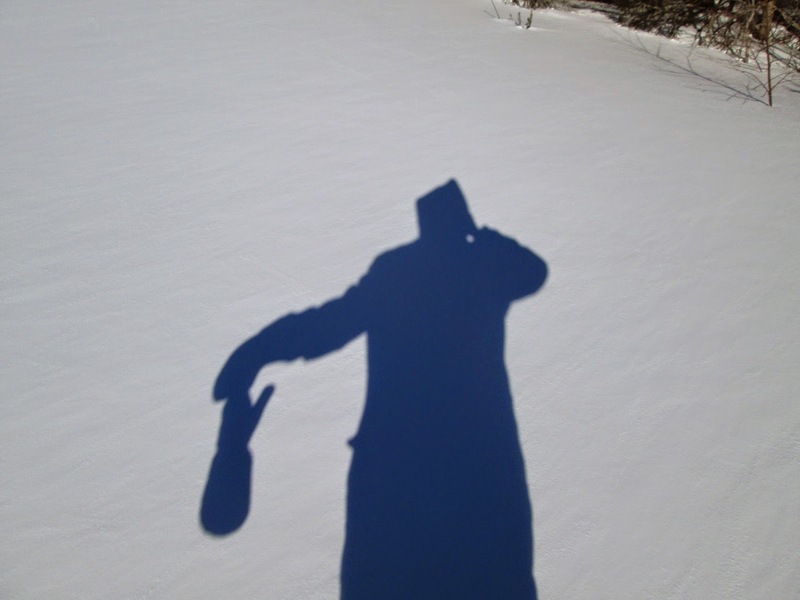 A nice silhouette of a snowshoer, -11 with a wind chill of -20 with sunshine. 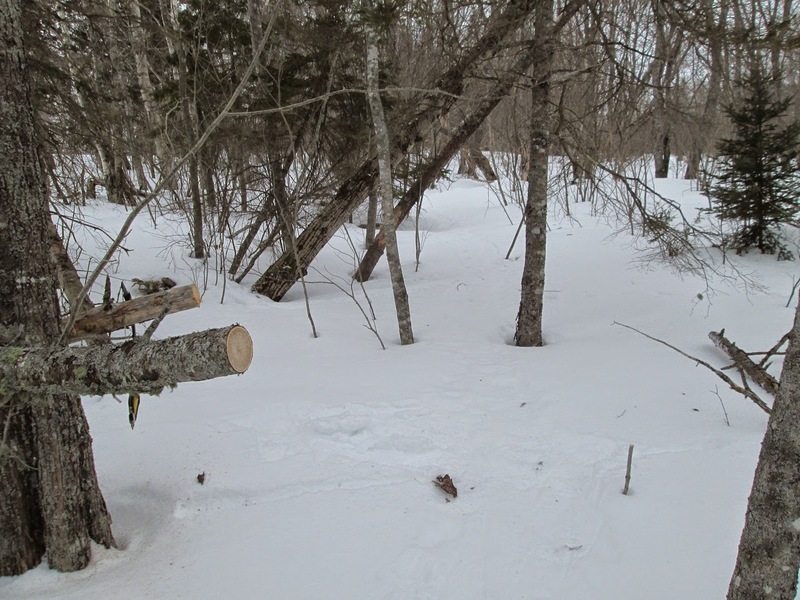 I was out on the snowshoes for 90 minutes today, I took my buck saw with me and did some cleaning of trees on the trail. Before the snow I could walk right under this tree but now no need to duck. 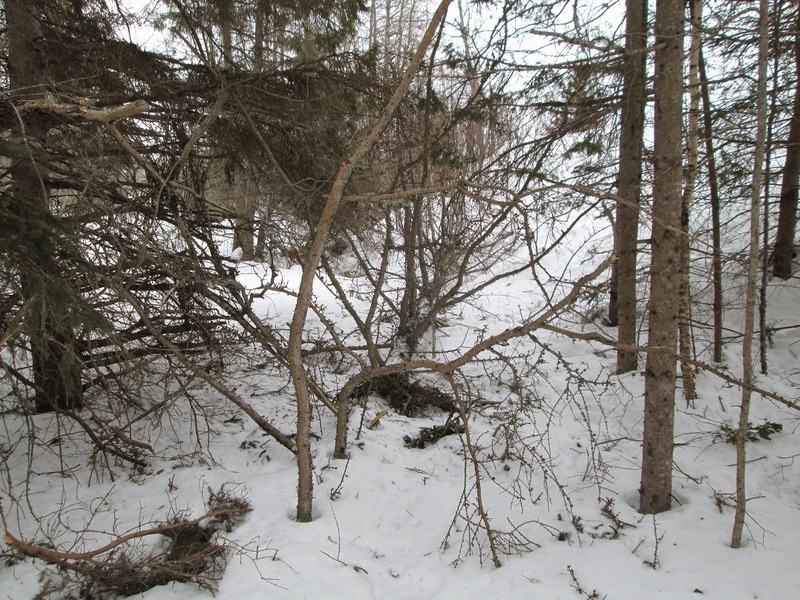 Three weeks ago the wind and snow took down this tree top, a few minutes took the branches off, the trunk will wait til the snow is gone. 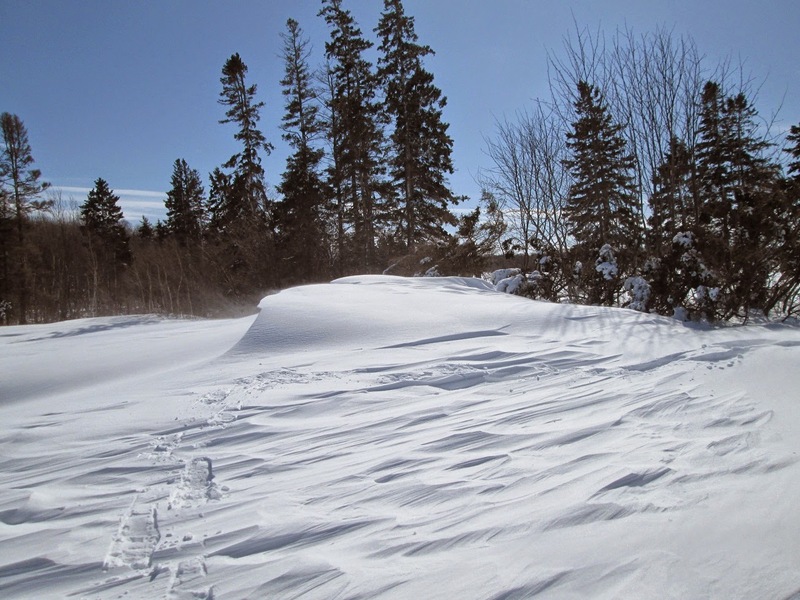 This afternoon it was windy with blowing snow with a temperature of -4. The bare ground is already showing though were I cleared yesterday. 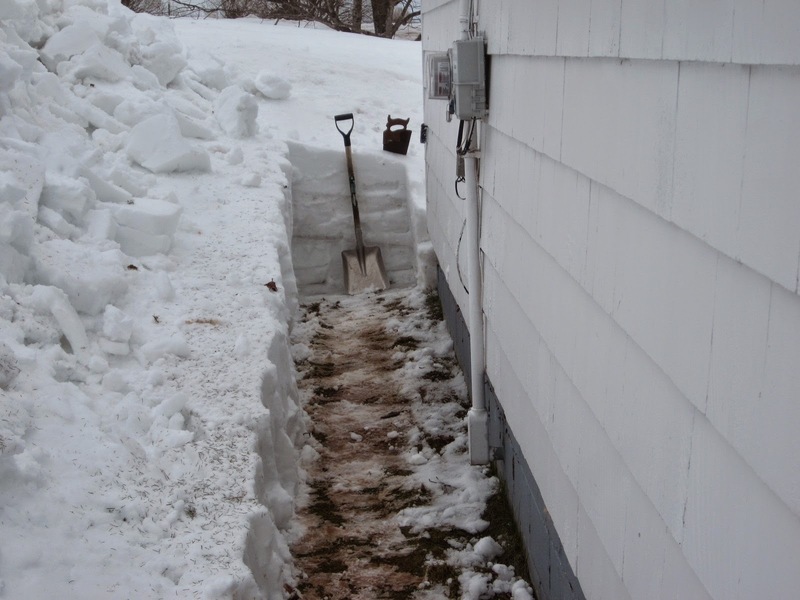 I shoveled the top of the drift in the afternoon, the snow is so hard I am using a hand saw to cut it into blocks. I was snowing foe a couple of hours in the morning in the Brudenell area. Mostly sunny with a light wind and a high temperature of zero.